French-inspired cuisine in a haute Hamptons atmosphere. 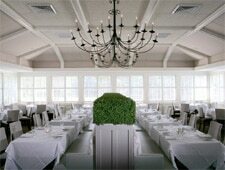 : Chef Christian Mir, a native of Southwest France, mans the kitchen at this East Quogue restaurant. The dining room, full of light thanks to wall-to-wall windows and white décor, is an ideal setting to savor the menu: a combination of French and other Mediterranean-influenced dishes, with seasonal variations. Try the tiny cheese ravioli with mussels and chive broth perfumed with truffle, or sample the tripe alla romana if offal doesn’t scare you off; this version is made with tomato sauce and a hint of spice. For mains, try the beef short ribs and lobster, a unique play on surf ‘n’ turf, served with root vegetables and mushrooms. Herb and mustard crusted rack of lamb is a star of the menu. Desserts include chocolate cake with chai ice cream, while the cheese selection is complemented by membrillo paste. Wines from Southwest France pair well with some of the traditional dishes, but other French labels, as well as Californian, Spanish and local Long Island bottles, also are available. Those unsure of what to select will be happy to find the Hidden Gems. Alternatively, settle in at the intimate, dark-wood wine bar for a few small bites to share, like a charcuterie platter or flavorful barbecue duck wings.